You know that scene in Star Wars: The Empire Strikes Back, Episode V when Luke Skywalker visits Dagobah to learn from the great Master Yoda? And there’s an awesome training sequence where Luke learns all this awesome stuff about the Force and raises his ship from the swamp. Now imagine that Dagobah is 20th century Paris. And Master Yoda is Nadia Boulanger. And George Gershwin is Luke Skywalker. I am in Paris for a short visit and would like very much to meet you again. I believe we met when I was here two years ago, through the Kochanskis. I have a letter to you from Maurice Ravel. 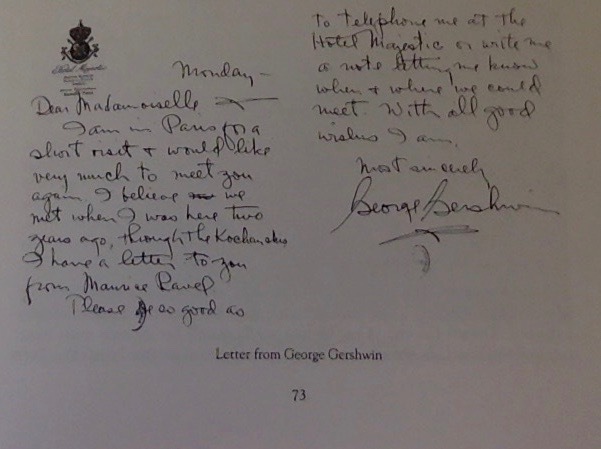 When they met, Gershwin requested that Boulanger instruct him in composition. Boulanger (unlike Master Yoda) declined. She told Gershwin that she couldn’t give him anything he didn’t already have. 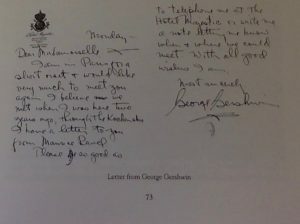 When one takes into consideration Gerswin’s musical styles,this letter and Boulanger’s refusal to teach Gershwin represent a unique perspective on developing American musical identity. While Gershwin’s contemporaries were building on European idioms and attemping to legitimize American identity thorugh the adoption and adaptation of American Folk idioms. Gershwin, one could argue, was also doing this, but instead of Anglo Folk idioms, relied on Jazz. His brand of symphonic jazz, already popular in 1928, has a unique sound. I posit that Boulanger’s recognition of this unique sound represents the changing perceptions of American music on the European continent. Boulanger recognized that jazz was one of the most unique idioms to come out of American music. Her approval of Gershwin’s symphonic jazz mirrors the world’s tacit approval of the appropriation of jazz in a symphonic sense. While white American elites, and (as evidenced by this letter) white European elites applauded the “raising up” of jazz idioms, composers and performers of color were struggling to gain a tenth of recognition composers like Gershwin were able to achieve. This notion reveals that the source material from which Gershwin drew was stil considered by many, even those in Europe, to exist outside of Art Music as an exotic “other”. Perhaps Boulanger’s refusal to teach Gershwin and mold his composition to her “refined” (read white westernized) musical ideals, as she did Copland, Glass, and others, helped American music to continue its unabashed appropriation of musical idioms from marginalized people. Perhaps this is the true identity American music. 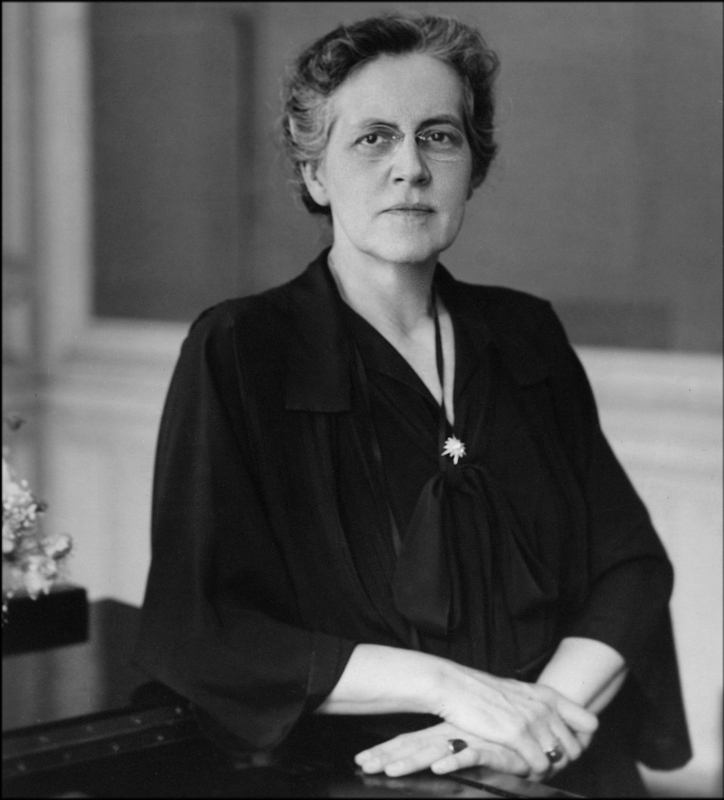 Nadia Boulanger is practically the undisputed master teacher of the 20th century. From Copland to Bernstein, her mark on American music is distinct and far reaching. Boulanger was born on the 16th of September in 1887. She officially began studying composition at the Paris Conservatoire at the age of 9 working with masters of composition like Gabriel Fauré. Boulanger herself was a gifted composer, but nearly stopped composing completely after the devastating death of her sister, Lili, in 1920. While this personal tragedy blighted a promising compositional career, it opened the doors for her teaching to come through. While you finish reading this post about Boulanger’s influence on American composers, listen to some of her compositions in this playlist. Please take a minute to learn more about Nadia Boulanger here. As a teacher, composer, and scholar, Nadia Boualanger had an immense effect on our modern perceptions of American Music and deserves to be considered as a major facet of American Musical style along with her many pupils. Spycket, Jérôme. Nadia Boulanger. Stuyvesant, N.Y.: Pendragon Press, 1992. Potter, Caroline. “Boulanger, Nadia.” Grove Music Online. Oxford Music Online. Oxford University Press. Web. 15 Jun. 2017. <http://www.oxfordmusiconline.com/subscriber/article/grove/music/03705>. Portrait of Nadia Boulanger from https://blog.edmodo.com/wp-content/uploads/2014/03/NadiaBoulanger_portrait.jpg.